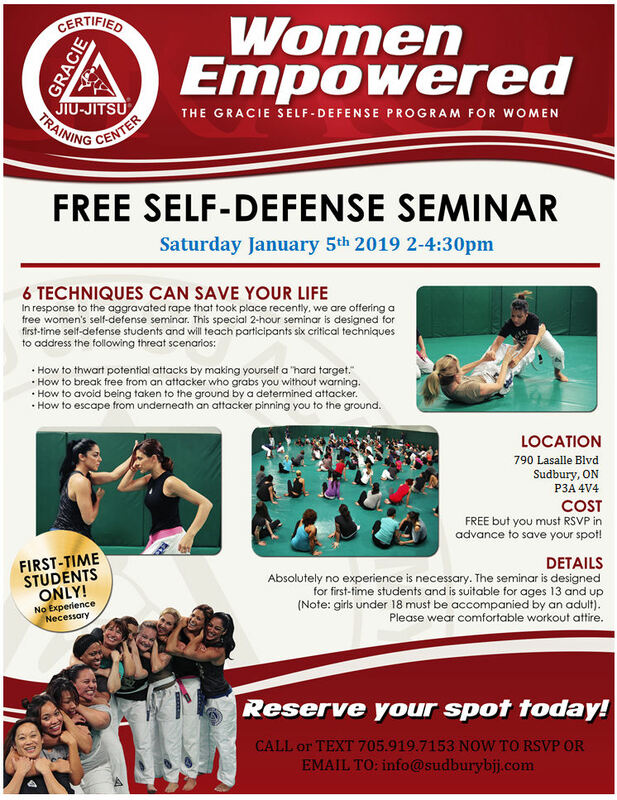 In response to a recent attack in NYC, where a woman was dragged by her ponytail from a public place to an isolated location, the Gracie Academy Certified Training Centre’s around the world are offering FREE Women’s Self Defence Seminars on Saturday, January 23rd. 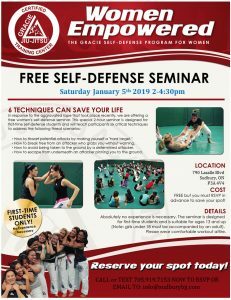 Our seminar runs from 3:30 to 5:30 and is open to the general public. We would like to show you some of our ideas and suggestions about how to use the ponytail grab as an opportunity rather than a threat. As women, we shouldn’t have to change the way we style our hair just to stay safe in public. Please invite all the special women in your circle. The concepts and techniques we will introduce you to may one day save a life. 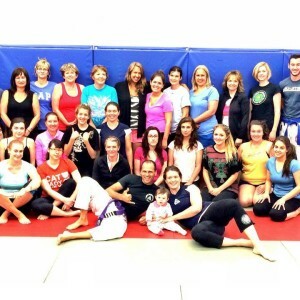 Our final chapter in our Children’s Character Development Program is Charity and what better way to incorporate the lessons we are learning into a day full of Jiu-Jitsu fun! 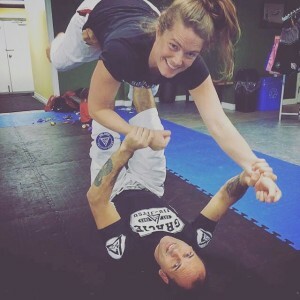 As you know, competing is just an option we offer to allow our students to have some fun with Jiu-Jitsu, test their skills in a safe environment, and help out a local charity at the same time. Only compete if you are 100% sure you want to. If you have any questions about whether your child is ready yet, please talk to one of our instructors. We match the children up into categories based on weight, age and experience. It is our goal for everyone to walk away from this with an awesome experience whether they win or lose! Our charity of choice is the Food Bank. Admission to the tournament is a non-perishable food item plus $5. The same fee is for spectators. Please be mindful when choosing your food item. Legumes, lentils, brown rice, brown rice pasta, canned tomatoes are all good options that are really useful in the kitchen as well as in the body. 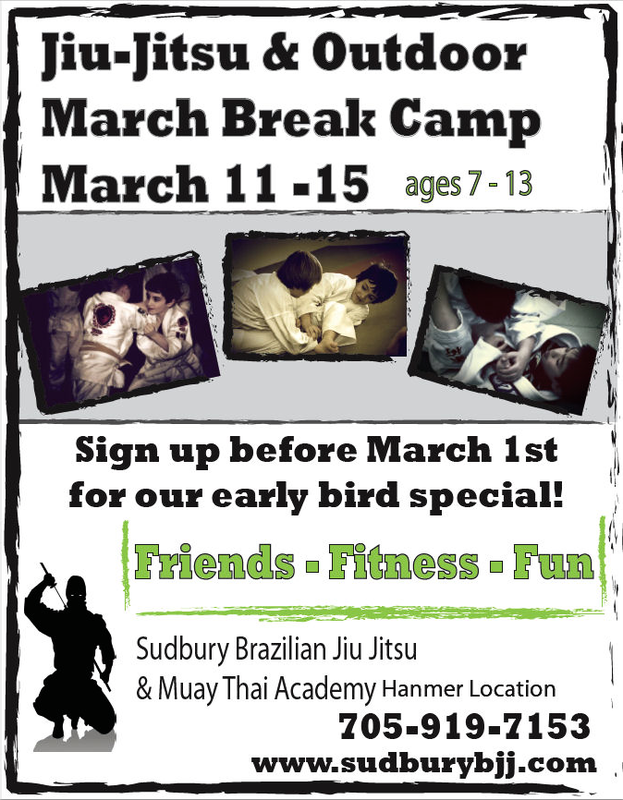 The tournament will be held at our New Sudbury location. All Hanmer classes and New Sudbury classes will be cancelled that day. The kids will start weighing in at 10am and the tournament will start at 10:30. Please show up on time. If any adults are interested, we will be having a submission only division for you starting at 1pm! Our annual adult Christmas Party is going to be a good one this year! Steve was keeping this a secret (I was not lol). He used to be in a band in the 90’s called The Cooperative. Some of you might remember them playing around town. I only hear stories and apparently they were kind of a big deal back in the day. Well our Christmas Party is going to welcome them back for their first show! I’ve been listening and watching Steve practice for this event and the music is funky and fun, it will surely get you out of your seats and on the dance floor. The party will be hosted by The Fromagerie on Elgin St., downtown. The tickets are $25 and will include food as well as the live band! Everyone is welcome, students, parents of students, everyone! Please join us to celebrate another great year at the Academy! Of course we can’t forget the kiddos when we are celebrating Christmas! This party is totally FREE and will be held at our New Sudbury location. 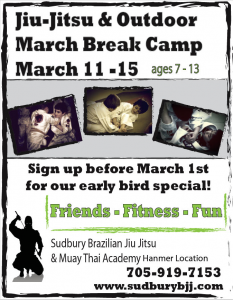 All kids in our program are welcome. We will have some snacks, fun, games and a dance party! The little ones don’t want to miss this! All kids classes will be cancelled so everyone can come to the party. Hanmer classes will be cancelled for the day and New Sudbury schedule will run as usual from 12pm – 3:30pm. If anyone has any questions about any of these events, please let us know! We are halfway through Bring a Buddy Week and I’m just making a blog post about it. Better late than never! We are seeing lots of new faces around the club and it’s fantastic. Everyone is sharing their passion for Jiu-Jitsu, Muay Thai and Fitness with their friends and families. Are they just really want our super awesome prizes….which one is it? 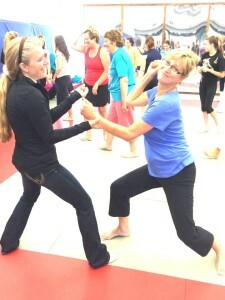 Either way, we love the fresh faces on the mats! 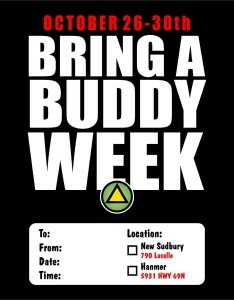 Haven’t brought a Buddy yet? What are you waiting for? Did you know what you can win? 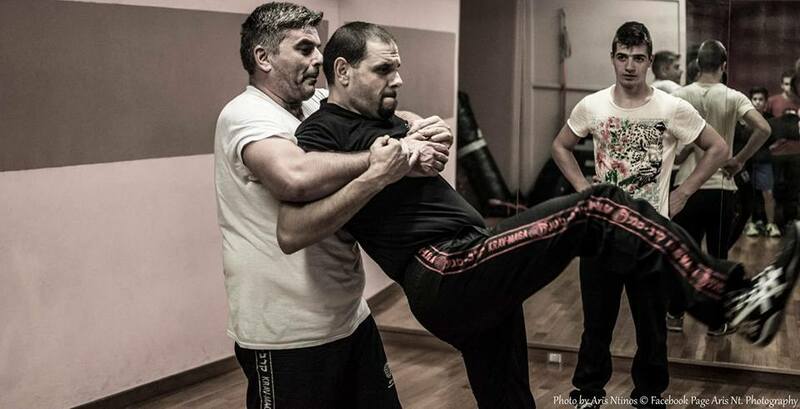 Every time you bring a friend in to try a class you get a ballot. It’s up to you which box you put your ballot in, one is for a Brand New Hayabusa Grappling Gi, one is for Leather Boxing Gloves and Shin Guards and one is for 5 Private Lessons with any of our awesome instructors! 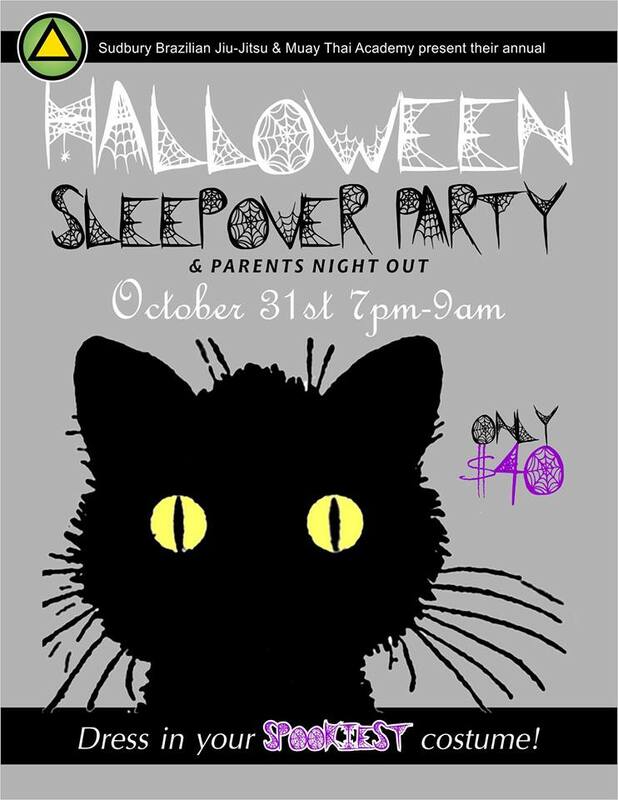 And don’t forget to sign up for our Halloween Sleepover Party! Spots are filling up FAST!!!! 7th Annual Halloween Sleepover Party!! Halloween is approaching fast and this year it lands on a SATURDAY! There is tons of buzz about some great parties happening around the city, are you wanting to attend one? But what to do with the kiddos? We have the ANSWER! Send them to us! This is our 7th year running our Night of the Ninja Halloween Sleepover Party and we are very excited to share it with your little ones. The party starts at 7pm, perfect timing for them to go out trick or treating then come over to the Academy at 790 Lasalle Blvd in the Montrose Mall for our Costume Party, Haunted House Party Favours, Tons of Games and of course, a Movie! The next morning we will fill them up with a delicious, nutritious breakfast smoothie and they will be ready to be picked up at 9am! We also have a party only option. They can be picked up as late at 11pm! Sounds too good to be true right? Well listen to this, we have another idea for you! Are you not looking forward to having all that Halloween Trick or Treating JUNK around the house? Who needs the temptation? Plus, a couple of treats on occasion are ok for kids but do they really need a pillow case full? May I introduce you to THE SWITCH NINJA!! 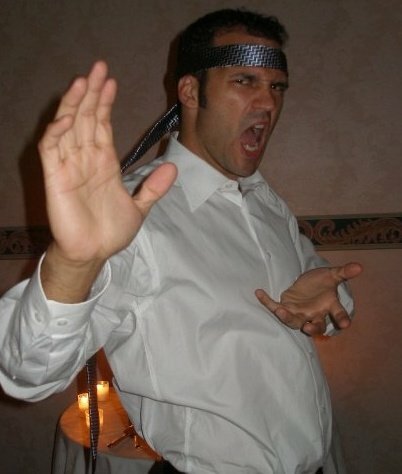 Ok, it’s actually Steve, but he is a ninja and he will be switching all of that Halloween Candy out for a SPECIAL PRIZE!! The kids can keep 5 pieces of their candy, and the rest comes to THE SWITCH NINJA. In return we will give them………………………they will just have to make the switch to find out!